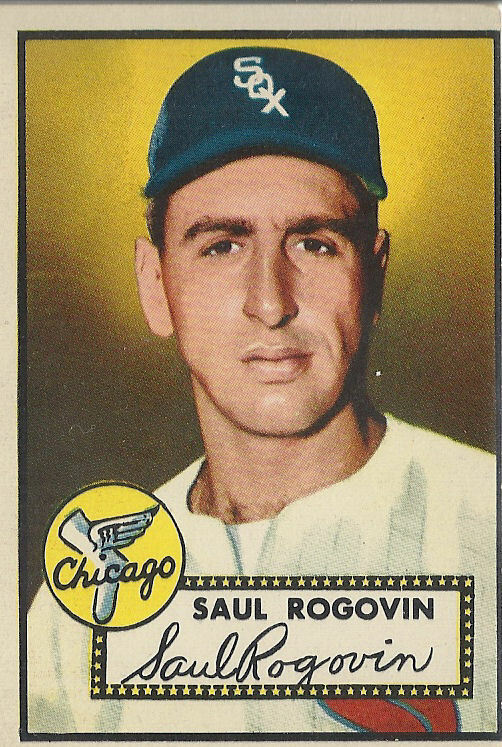 When to comes to the terminology applied to the "old school" era of Topps cards (essentially 1948-93, or just before the start of the "UV era") there are errors of commission and omission occurring daily, especially on Ebay. I think a refresher and even a look back is in order as clarity is greatly needed. 1) The "Changemaker" era, running from their founding in 1938 until the little cards started to be inserted into penny packs of gum ten years later Click here to see (also relates to #2a below). 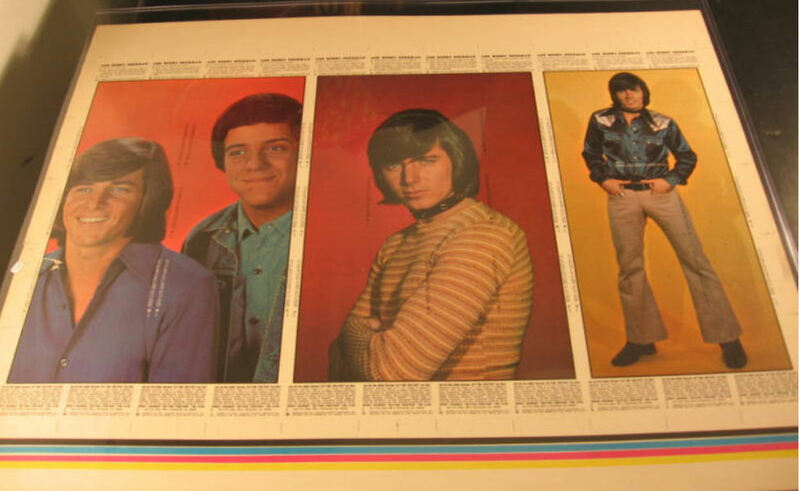 b)"Mid Size Insert" era. Freedom's War would be a good example of these. 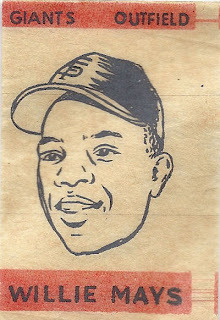 a) The "Giant Size" era running from 1952 until just after the purchase of Bowman, i.e. 1956. 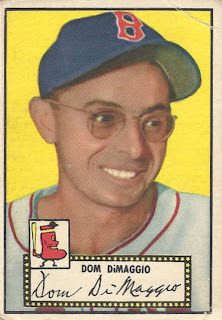 1952 Topps Baseball is a stellar example. ii) the "Expansion era from 1962-69 (concatenating--or vice-versa-- the "Duryea" era commencing in 1966 and the "test" era also from around the same time). 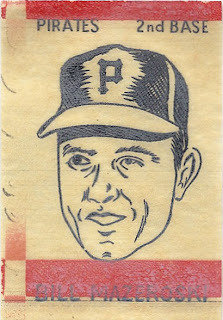 Prior to 1966 could also be considered the "Brooklyn" era. I don't have anything 100% on point but try this. iii) era of "Normalization" from 1970 through 1975. If you are a non-sports collector part of this would be the "Wacky" era too! b) "Upper Deck" era in 1989 and going up through '93. 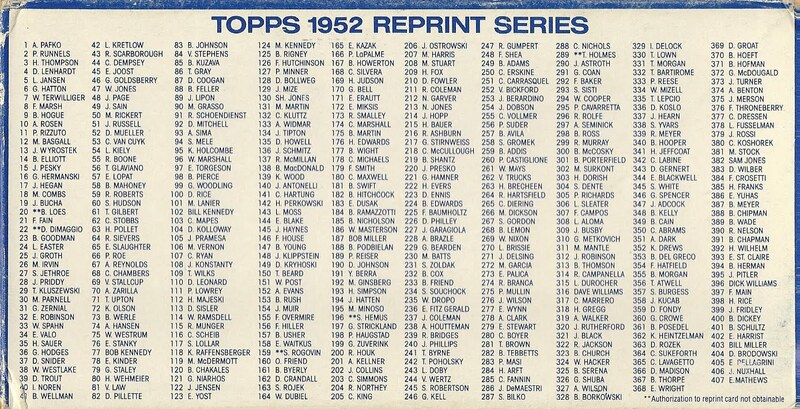 1989 was also the year of the Topps Auction at Guernsey's, a game changer and then some! 6) From 1994 we have the "UV" era, a time when things started off very silly and then fell off a cliff with a bewildering array of product lines, manufactured scarcity and just all out buzzkill. Now, what do we do about all those types of cards? 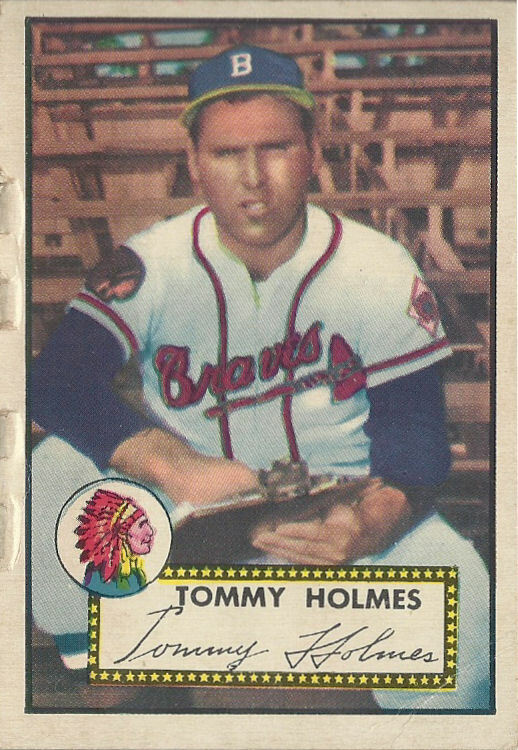 Proof-I would say a proof is something created to determine the correctness or physical viability of a planned product, solely meant for in house use by Topps. I think blank backed (or front) cards generally fall into this group (not counting those where a printing mishap caused a blank side on a card that was packaged) as they would be used to check the printing of planned press run. Something like the 1970 Cloth Baseball Stickers would be more in the "physical viabilty" camp, i.e. a materials test. A test issue would be something that was released in small quantities to see if an item would sell, generally tested in generic white boxes and wrappers, except for an identifying sticker. Some later test issues would use a repeating design pattern without identifying the product on the pack, presumably since the display box identified it. Some would even be created for focus grups of kids in almost a "pre-test" phase. 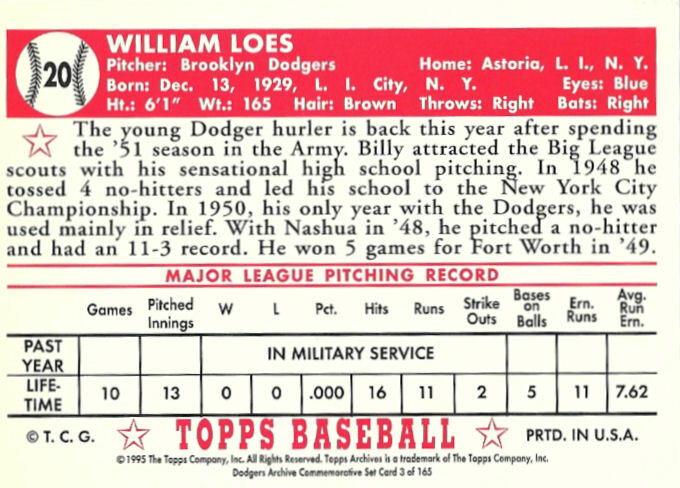 Even after their move to PA in '65 Topps would still test cards locally with kids in Brooklyn using traditional focus groups and also a form of give-aways at local schools (more on this down the road, kids but it might be a while). Some issues were tested and then sold at full retail. Sometimes they would be changed from the tested version, sometimes not. 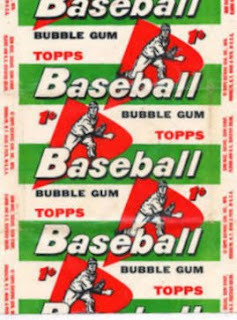 Test issue is one the most abused terms when it comes to Topps; many auctions use the term incorrectly in order to drum up interest. A pulled release would be a finished product for which partial or complete packaging may or may not exist but where the product was completed and intended for sale and then not officially released for some reason, usually due to licensing issues or larger-scale production difficulties. A limited release would be a product either not intended for full retail sale (think 1967 Red Sox and Pirates Stickers) or one that did not sell well and warranted no further press runs beyond the first or possibly second printings. Many of these would be found by "dumpster divers" in the mid to late 60's and early 70's near Topps Pennsylvania plant, some of whom actually went to the local dump on a regular basis to look for treasure tossed by Topps. Many times these would be product returns. I'll post on this fun aspect of collecting pretty soon! 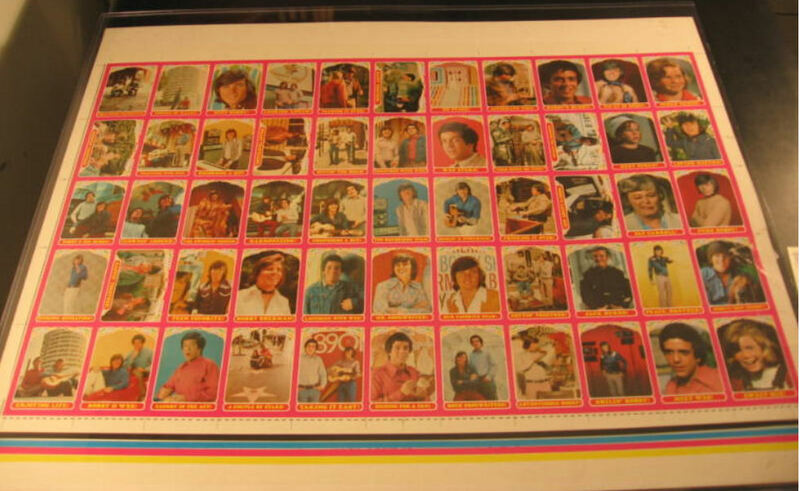 A full retail release such as 1971 Topps Football is self-explanatory but could contain or make available other types of releases such as inserts and premiums (see below). 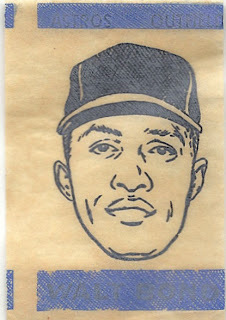 A promotional release would be something like the '64 Banquet set. a) between pulled and test; product not intended for sale that made it out to some form of retail by mistake. Call it Mistaken. 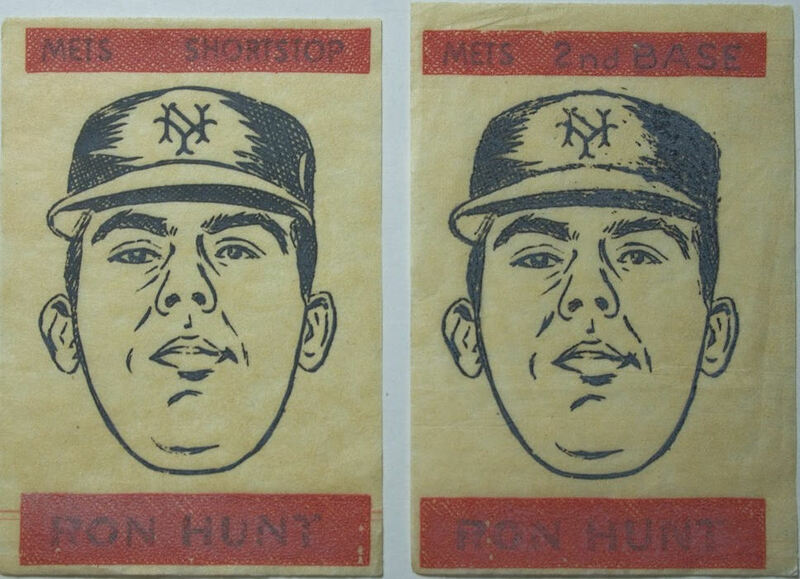 I am not sure if the '68 Baseball Plaks are in that category but they are close if not. 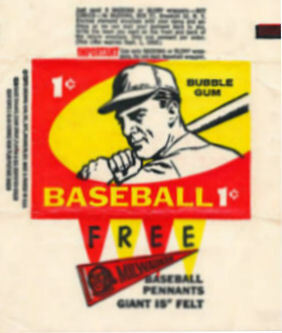 b) product never sold at retail but "released" through Woody Gelman's Card Collector's Company. Call it After Market. 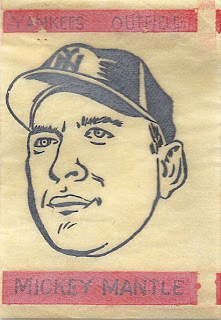 There are also items created by Topps Art Department for in house pitch meetings. Many of these are products that did not make it beyond this stage. I have heard that only 1 in 10 pitched productes actually made it to some form of production. I am struggling to define the three card strips though, that are so prevalent (and which I like and collect) especially the ones with finished backs. Three card salesman's samples are well-known, so are the "regular" strips a by-product of this? Would a salesman drop off a sample with ordering details plus few other strips that had regular backs? These are an odd combination as 11 card rows would not seem effective for producing three card strips. 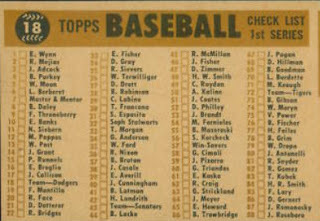 The 3 card strips were in the hobby well before the Guernsey's auction and in some quantity and with much variety. You really don't see 2 card panels, although some do exist. Sports strips seem more common than non-sports. I won't link these (yet) as an imminent post or two will get into these. Premiums would be something you had to mail away for, as would some contest cards. Third Party Productions, items for in-house distribution and prank cards all have their own place. And we can't forget inserts! Come to think of it, it's all pretty Wacky! I am generally not a fan of modern reprint sets. The card stock is usually too glossy and much flimsier than the originals, the fonts are often mangled and they just don't look right in most cases. That is especially true today. There are a couple of exceptions to this rule and the one I like most is the 1952 Topps Baseball Reprint Set, which was issued in 1983 as a limited edition of 10,000 and sold by Topps for (I think) $35. From the time the set was announced there was rampant speculation in the hobby press of the day (which was at least four or five deep in monthly publications at the time) and dealers took sides as to the validity of such an undertaking. Some felt it would undermine the value of the original set while others thought it would push up the price of the older cards. This question vexed the hobby for months as Topps rounded up the players or their estates and got their permission to reprint and reissue their cards. In the end they would fall five contracts shy of a full set (more below on this) and, while we were all roiling in the aisles, managed to issue a very sharp looking set. 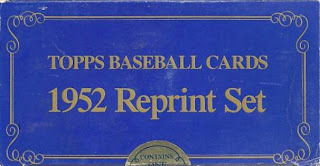 That seal says "Contains One Complete Reprint Set" and you had to break it, of course, to get to the cardboard within. There is even a product code on one of the sides: 1-383-28-01-3. At one time sealed sets were going for close to five hundred dollars although you can get them for less than half that now. A few more bucks will get you the missing five cards and you'll still be way ahead when compared to the mid five figure price tag of an original printing. 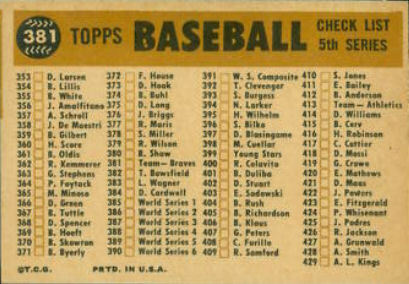 I would be remiss if I did not take a peek at the 1960 Topps Baseball Checklists before diving into the expansion-era sets. 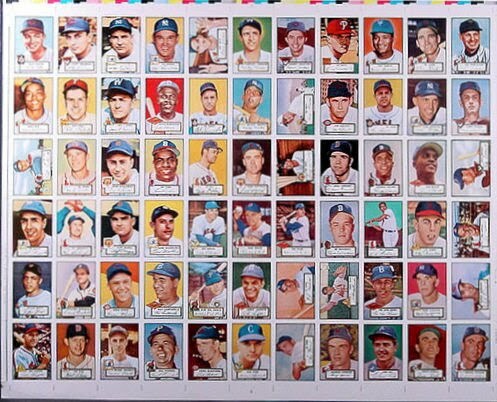 The 1960 set was covered here over a year ago when the various flavors of card stock that were used in the set were examined in almost excruciating detail. By ending the 5th series at #429 when in actuality the fifth press run went to #440 (110+88+88+88+66=440) the lag reduced to 11. 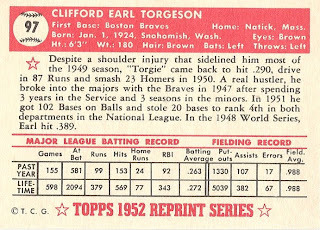 Things would change a bit for 1961 as Topps grappled with players on the move and two new teams just as they were getting into a groove. 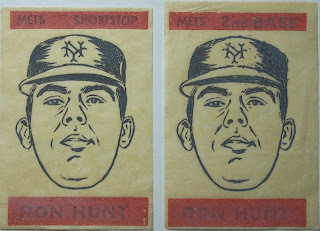 There is variation with the Ron Hunt Transfer. I'll let Chris explain it all and try to take a closer look at the printing and packaging aspects of this set here. 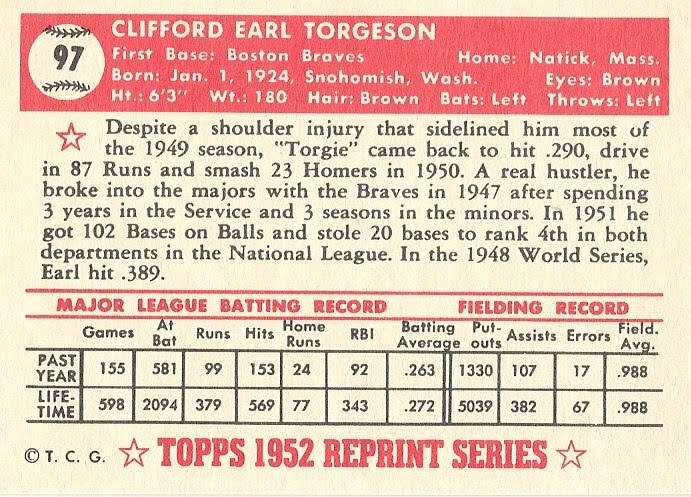 I would agree with Chris that the Shortstop version likely was printed first. Now, does Chris agree with me that the image looks like John Candy? If we take as true that these were printed in three runs of 24, then at least one run must have undergone a second printing. I had heard years ago a group of these were tougher than the rest of the set but details were (and are) sketchy on that. 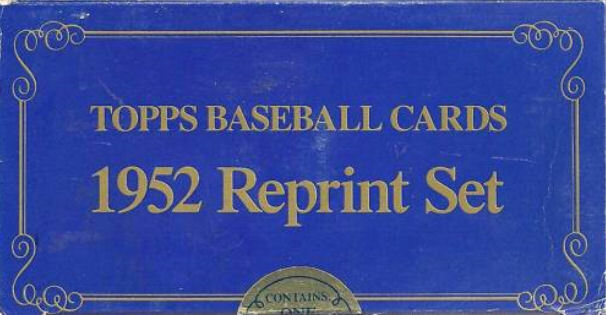 If Topps started seeding them into the last run of 2nd or 3rd series packs (after the Embossed cards finished off) then maybe a quick first run produced the SS variation and it was corrected for the next. The Transfers would then have been issued 24 per series through the 5th or 6th series. 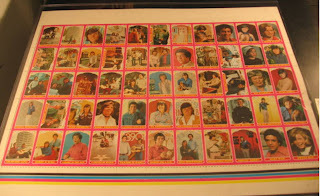 Now when you look at how these were printed it's pretty obvious little care was taken with these, a common practice with the cheaper 60's inserts. 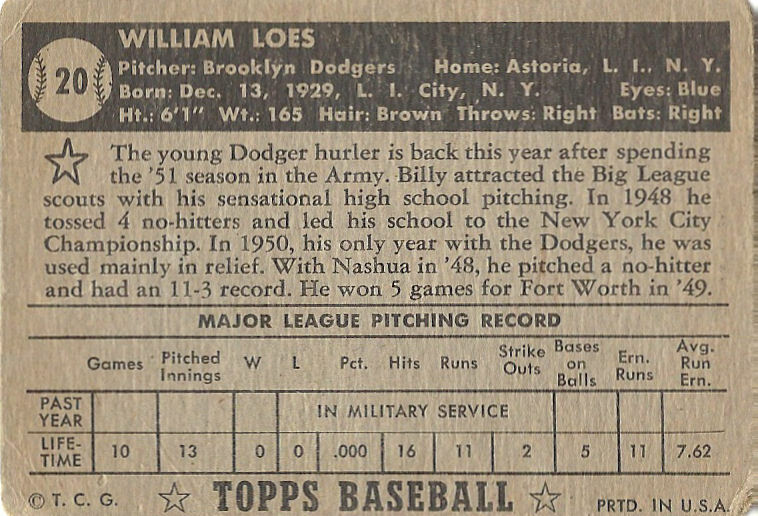 1965 was probably the last year Topps printed the baseball cards in Brooklyn, before moving production to Duryea, PA (or it was the first year printing took place there) so I wonder if they intentionally created inserts that were simple to design and execute? Both inserts are very generic looking, aren't they? I'll have to take a look at the Embossed set soon here but they are not exactly high art. We still have the checkerboard effect. Topps would use a different method to guide the cutters of the 1966 Ruboff inserts (another future post), namely a a black bar dead centered at the bottom of each piece which could have been developed due to problems in cutting these. Miscut but no checkerboard. Good luck reading his name though! That may be from the end of a run but the blues are harder to read, at least in my experience. I would not be surprised if other variations lurk within. 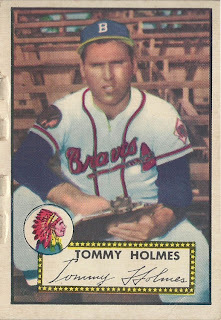 This set is not widely collected and is a little harder to find than other mid 60's inserts so check your sets and see! 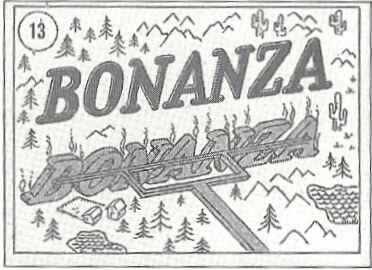 As many of you know, I consider the Topps Bonanza set to be the among the rarest of their many rare offerings and offhanded print jobs in a history littered with four figure commons and prized sets of rejected ideas that command five figures. It may even be #1 on on the rarity scale. There is the tiniest hint of red in the knot of the lariat near the lower right corner. A nice touch! Click to see more details. 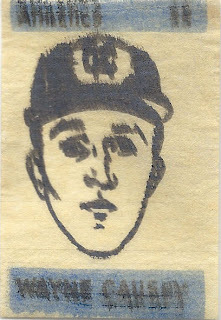 That is the back of the leftmost card in the trio #13 "Cheer Up, Hoss". In addition to the other two shown, the NSB lists two other cards: Adam Cartwright and "Private Talk". I don't see any copyright information nor indications the cards were printed by Topps so the in-house theory looks good to me. Numbers up to 16 are known and I would not be shocked if 28 subjects exist (a common number for some of these sets). Like many other TV sets in B&W, the date of attribution is 1965, although take that with a grain of salt. Some if not all known examples have staple holes and there may only be one of each card in existence. 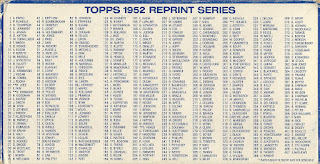 Topps Vault auctioned off their stash and that is that, as they say. A lot of their historical information has vanished from their site so some mysteries will continue to command attention. Still drifting toward the 60's time trippers! Time though now to quickly look again at 1959's print runs, helpfully aided by a recent SCD article on this set. I wasn't aware we were both doing our own year-by-year reviews actually so I may veer off elsewhere for a bit for the rest of June-we'll see since predicting how this blog will be created post-by-post is like trying to get a grip on my 401(k), both being moving targets. b) more then one firm printed the cards due to high demand. 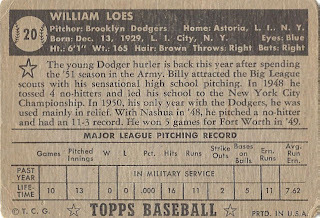 From what I have been reading of late, Topps printed cards at various locations in Brooklyn and also printed cards in Philadelphia at Zabel Brothers. The Zabel Brothers story is starting to reveal itself to be sure but Philly seems to have been a focal point Topps' non-Brooklyn printing since 1951, as described here in too many posts to link. 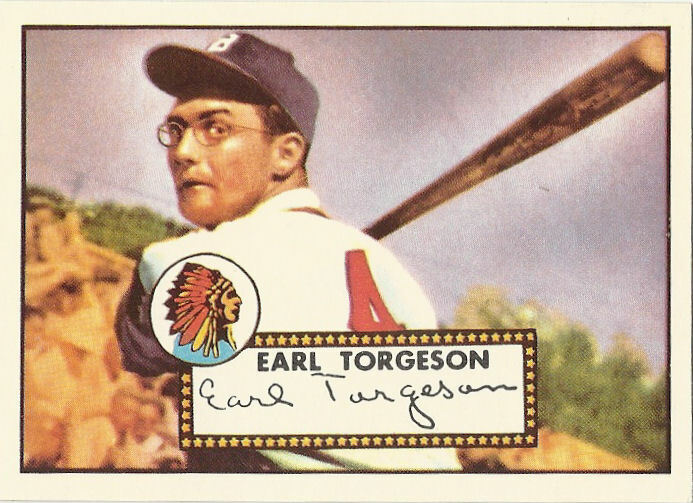 I still believe Topps sometimes printed cards in Rochester, NY when there was a need for whatever reason but that is still tenuous and I think that practice may have ended a little after they bought Bowman. 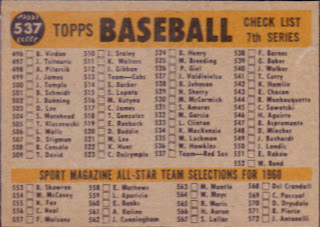 While they did not just slap together a high number series in '59 like the year before (which we know due to the seventh series checklist starting at #496 and not #507) the nosebleed section still was littered with rookies and no-names for the most part, in addition to the All Stars and a few other special cards. Seven series must have kept their sales force busy! 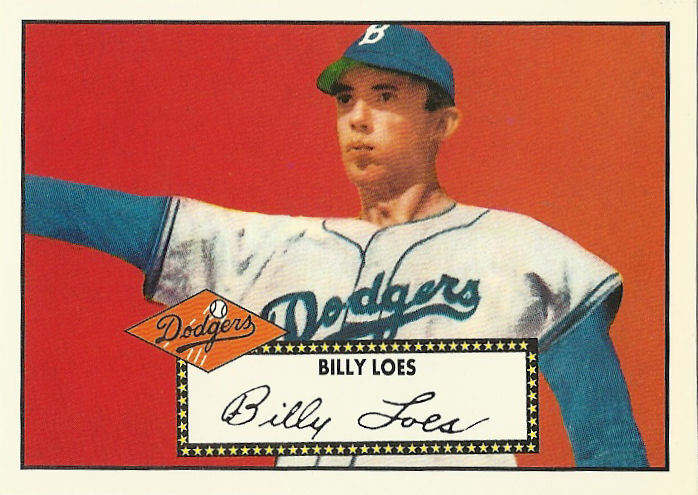 Before I go into the vagaries of the last pre-expansion baseball set Topps would produce in 1960, I thought I would take a fond look back at the cast of characters in the 1958 high numbers once more. 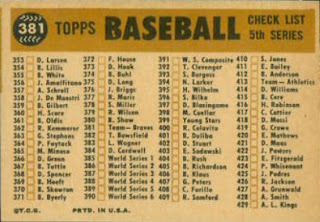 The 1958 checklists, you may recall, were designed to describe five series of 88 cards apiece and end at #440, which I believe was to have been the full set as intended by Topps. Then when the Stan Musial signing gave them the opportunity to rush his All Star card, they jury rigged a quick 55 card high number series that contained the All Star cards and a bunch of players either just starting out their MLB careers or who were journeymen ending theirs, that let them get the cards to market before the football cards kicked off. 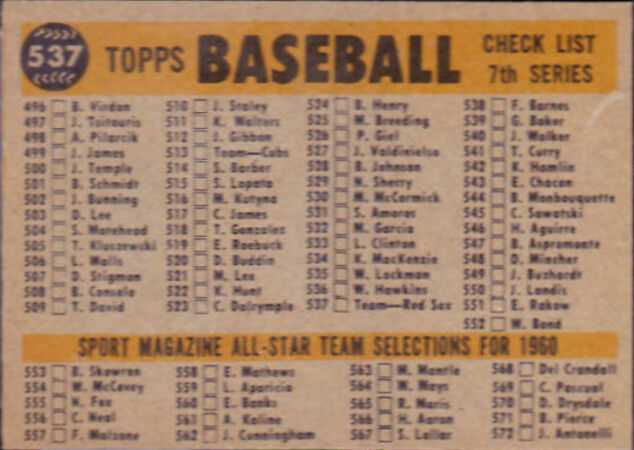 I had theorized previously Topps had triple printed the Musial AS and also Mantle's on at least one side of the sheet but am rethinking that a little. 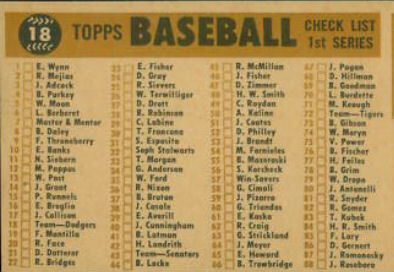 Assuming the extra rows were each on a separate half sheet then any given card, other than the Musial and Mantle AS cards and four pulled commons, would appear at least four times on the 264 card master sheet, while 16 players (the eight leftmost in each "extra" row) apiece would have two additional slots. 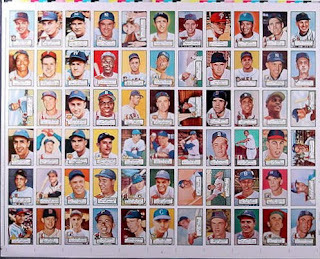 The Musial and Mantle AS cards would also appear have six additional slots apiece in this scenario while the four pulled commons would stagnate at four appearances. 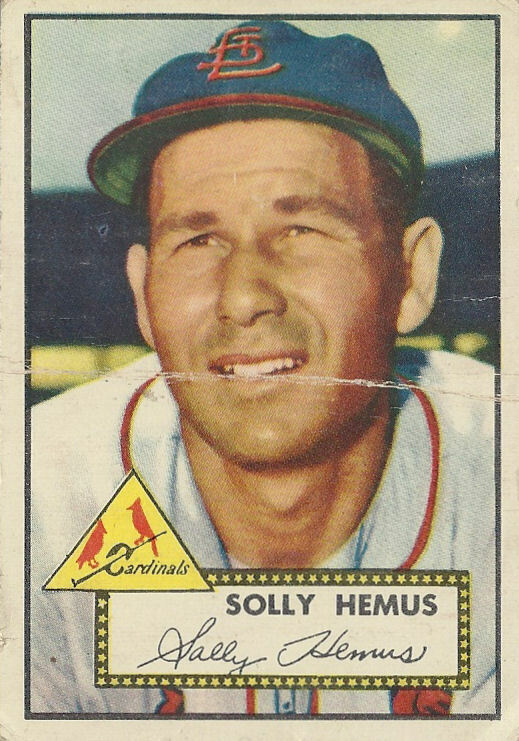 -2 cards appear 10 times (Musial AS and Mantle AS). That's (37 x 4) + (16 x 6) + (2 x 10) = 264 card full press sheet. You could have other arrays as well but I like this one the best of all the potential print runs. 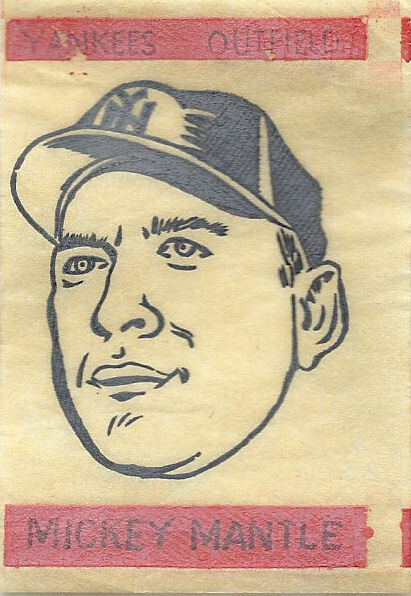 #472 Joe Jay - 31 games over four seasons and all of one in '57 for this "bonus baby"
I never really thought I would post a follow up on one of Mrs. Archive's favorite sets but I ran across a couple of choice scans on Ebay that just had to be shown. Yes, we are talking the 1971 Getting Together With Bobby Sherman set once again!